The first big screen SpongeBob SquarePants movie arrived in theaters Thanksgiving weekend 2004. In Sponge Bob SquarePants 2, SpongeBob goes on a quest to discover a stolen recipe that takes him to our dimension, our world, where he tangles with a pirate. The SpongeBob SquarePants: The Movie took in over $85 million at the U.S. box office which, today, would be well over $100 million. 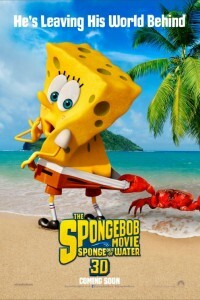 The official title for the movie is The SpongeBob Movie: Sponge Out Of Water.